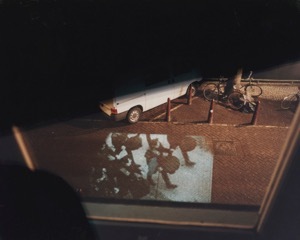 For this 1995 project staged in Amsterdam, Shimon Attie mounted projectors in the windows of homes that sheltered Jews during the war, and projected onto the street below archival footage of German soldiers, passing funerals and military bands. The project is only visible in the current exhibition through slits in a wall. “It puts you in the position of looking out, from being in hiding,” Attie explains. The project probes, in its oblique way, the reputation of the Dutch as heroic shelterers of the Jews, based largely on the iconic power of the Anne Frank story. 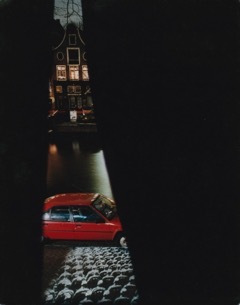 In fact, Attie points out, nearly 80% of Amsterdam’s Jews–all “neighbors next door”–were deported and killed, betrayed. 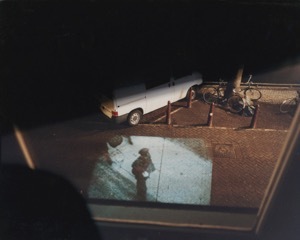 As art critic James E. Young wrote, the images forced the Dutch passersby to confront the national myth of how the Dutch sheltered Jews, and to immerse themselves in the hidden Jews’ memory and see the outside world from their perspective. 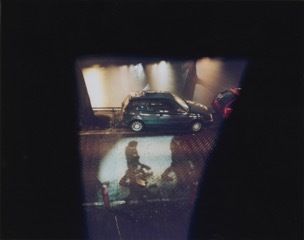 Shimon Attie (b. Los Angeles, California, 1957) is an internationally renowned visual artist, whose work spans photography, video, site-specific installation, public projects, and new media. For two decades, Attie has made art that allows us to reflect on the relationship between place, memory and identity. By superimposing prewar images on modern sites, Shimon Attie attempts to capture a haunting time.